OK, I need to hear from those with broken passenger cup holders. I am starting to cad some replacement parts. I can CNC and 3D print. 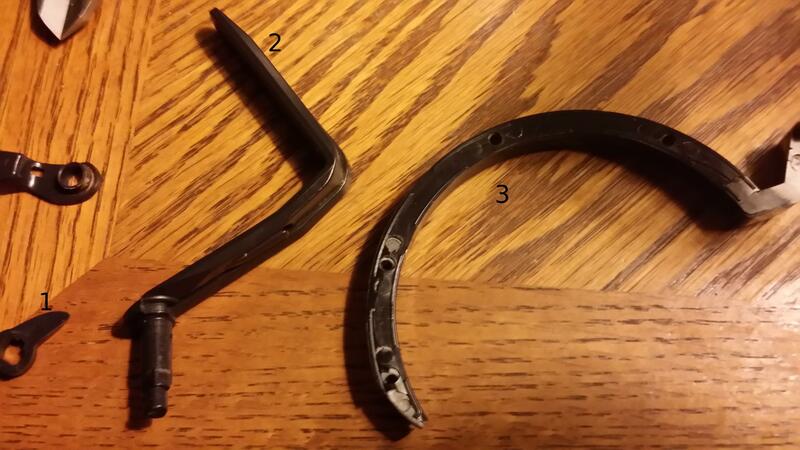 What I think is the major problem is the 3 plastic parts I have labelled in the attached photo. I need input from those that have broken ones as to what parts are broken on theirs. Please respond with the number of the parts you have that are broken or if it is one of the metal parts. If you are missing the entire thing, let me know that too. 07 GXP Aggressive Red, 5 speed, RPM Motorsports custom tune, Customized Cold Air Intake, DDM Charge Pipes, Solo Performance Test Pipe, Magnaflow 3" dual exhaust, Custom Windscreen, Puddle lights, AEM water/meth. Dyno 355 RWHP and 391lb/ft torque on e47. The issue is over travel of the mechanism allows the curved articulating arm to come out of the sliding slot. If you put the arm back into the cup holder and don't force it to over travel it works fine. The 09 cupholder design is updated to prevent over travel. I have modified cup holders to prevent the over travel and they work fine. The second issue is when closing the mechanism tends to stick. If you pull slightly on the curved portion it will prevent the sticking and the cup holder will function as designed. My Solstice is an 09. The cup holder is intact, but I'm wondering how long it will last as it seems pretty weak for my big coffee cup. I have 6 people that have contacted me so far with a broken plastic piece. Not just the issues mentioned by Rob in his very good write up. So I have moved forward with the most common part, the circular ring that goes around the cup. Pictures to follow. Last edited by MarkGXP; 08-15-2016 at 08:49 PM. I too have a broken cup holder with the forward circular part problem. I am very interested in getting this repaired/replaced. I just realized that my passenger side cup holder is also broken, missing part of the ring that holds the actual cup. Is there a fix for this? Is it easy t replace the cup holder? Appreciate any input. Thank you. I am still tweaking on my 3D printed design of this part. I will post up once I get it perfected. My cup holder has the half circle piece missing, broken and missing. Do you have any idea on the replacement cost and procedure? For all but the 09 model year, the forward cup holder is held in by tabs. You can insert a panel tool and work it out of the forward console. The 09 cup holder is retained by a single screw. Yeah, I have been busy lately and haven't came back around to finish this project yet. I am torn between continuing this path to print the perfect replacement or go with another idea I have that replaces the entire assembly. Considering that option for my CNC but not ready to share just yet. Last edited by rob the elder; 09-29-2016 at 06:07 AM.